2013 may go down as the year of fantastic world-building. Of course a lot of that is due to what I’ve chosen to read, but I can tell you that Tessa Gratton’s new release The Lost Sun, the first in The United States of Asgard series, will join the parade of really wonderful and exciting new worlds that I’ve discovered this year. I was lured in by the promise of Norse mythology and a Holly Black-like read, and that’s an accurate description. 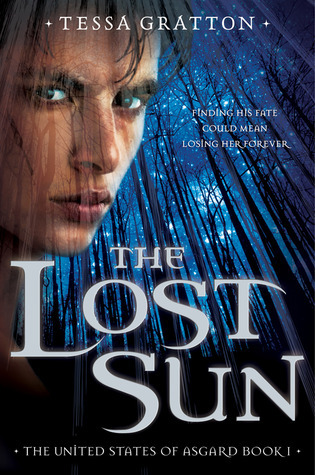 The Lost Sun is the best young adult fantasy I’ve read this year. Fans of Neil Gaiman's American Gods and Holly Black's The Curse Workers will embrace this richly drawn, Norse-mythology-infused alternate world: the United States of Asgard. Seventeen-year-old Soren Bearskin is trying to escape the past. His father, a famed warrior, lost himself to the battle-frenzy and killed thirteen innocent people. Soren cannot deny that berserking is in his blood--the fevers, insomnia, and occasional feelings of uncontrollable rage haunt him. So he tries to remain calm and detached from everyone at Sanctus Sigurd's Academy. But that's hard to do when a popular, beautiful girl like Astrid Glyn tells Soren she dreams of him. That's not all Astrid dreams of--the daughter of a renowned prophetess, Astrid is coming into her own inherited abilities. The United States of Asgard is familiar and yet not at the same time. It’s America if the Norse gods were real, living beings who traveled with European settlers to the New World. It’s a world where magic and soothsaying are commonplace, where trolls live on the edges of civilization, and where the gods are featured in televised rituals at every major holiday. In this world, Soren Bearskin is the teenage son of a disgraced, deceased beserker, and all he wants is to escape his fate. That desperate dream will be challenged by the arrival of Astrid, a girl who lives out her destiny with joy, and the disappearance of Baldur, everyone’s favorite god of light. Soren is a warrior in training, and he spends almost every waking moment controlling his inner beserker rage. He hopes against hope that if he holds the madness at bay long enough, it will leave him – leave him free to pursue a life beyond that assigned to him at birth. This struggle, this wrangling with who he is and why, leaves him a serious, stoic young man, constantly fighting the ripple of battle rage in his blood. That bottling up of what should be a natural part of his nature makes him attractive to Astrid, but it serves Soren as a barrier between himself and anyone he might hurt, leaving him lonely. Soren’s growth throughout the book hinges mainly on the bit-by-bit breakdown of these walls, of learning that holding back may not be the only way forward, and making decisions and sacrifices that demonstrate to him (and others) that he can find an honorable destiny that does not necessarily deny fate. There are other characters, important ones (Astrid! Baldur! etc., etc. ), but as Soren’s is the only point of view, the thing I really want to talk about is Gratton’s world-building and writing. Both are, in a word, SUPERB. Regardless of whether you like the story or not (and who, I ask, would turn down a road trip epic with mythology, battles and the fate of the world in the balance? exactly.) the United States of Asgard will pull you in and take you for a ride. The extensive holiday traditions, the just-twisted place names, the characters and stories of the gods and their interplay with human history – these are all part of a richly-imagined landscape that seems entirely real. I expected to turn on the television and see Freya in a cape of feathers, or Odin and his missing eye. I can’t wait to read the next books in the series and discover what Gratton has done next. The Lost Sun was absolutely brilliant. Recommended for: fans of Holly Black, anyone who enjoys twists on mythology and contemporary fantasy, readers who revel in alternate histories and excellent world-building, and those looking for smart, beautifully-written young adult fiction (or any type of fiction, really!). Ooh! Ooh! Ooh! A few years back, I fell head over heels in love with one of Gratton's short stories. I'm thrilled to hear she's turned her hand to Norse mythology now, and with such great results. Well, I am a HUGE fan of Holly Black, so I will add this to my list!